Energy travels through no "time or space" which means that healing energy can be sent to anyone, at any time, regardless of the siutation or loaction where the person and healer are at. Distant healings are just as effective as in person healings as long as the individual is open to receving divine, healing energy. 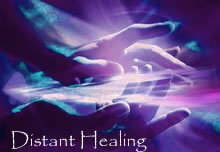 During a distant healing, you will receive a time slot where the healing will take place and invited to take a comfortable position and to have at least an hour of uninterupted time. Once you are in a comfortable position, close your eyes and allow yourself to connect to the healing energies. The distant healing will take aproximately 30 minutes but you are invited to take at least 10-15 minutes to gently allow the energies to assimulate. Within 24 hours hours after your distant healing, you will receive a descriptive email of any observations and insights that were noted during the distant healing. To schedule a distant Healing, please process your order and you will receive an email to discuss your scheduled distant healing.